Determine what a seed needs to grow into a healthy plant. Explore the effects of light intensity, water levels, and soil additives on plant growth. Design a controlled experiment to investigate a question. Collect data from multiple trials. Analyze data using tables and graphs. This worksheet allows students to experiment with one variable to determine the optimal conditions for gr... (more)owing the tallest plant. They then describe the evidence that supports their claims. This worksheet allows students to evaluate several graphs of plant data and match them to the correct exp... (more)erimental setup. They then describe the evidence that supports their claims. This is a supplemental worksheet to allow students to run additional trials using water as the independan... (more)t variable. It has an additional chart to gather data and two questions about student's conclusion. This is a supplemental worksheet to allow students to run additional trials using light as the independan... (more)t variable. It has an additional chart to gather data and two questions about student's conclusion. This is my scientific method unit final. I adapted the Student Exploration into a test due 1 week after b... (more)eing assigned. The idea is for them to practice the process. Use the 3 variations separately for differentiating, or combine one of the guided labs with the "ask your own question" lab. The following Plant Journal was created by Tortuga Elementary, FL staff. The pages should be run 2 sided... (more) and then assembled hamburger-fold style with pages offset to show My Plant Experiment, STEM Kit Supplies, Planning Exp., Experiment Findings, Conclusion, and Taking it Further tabs showing. 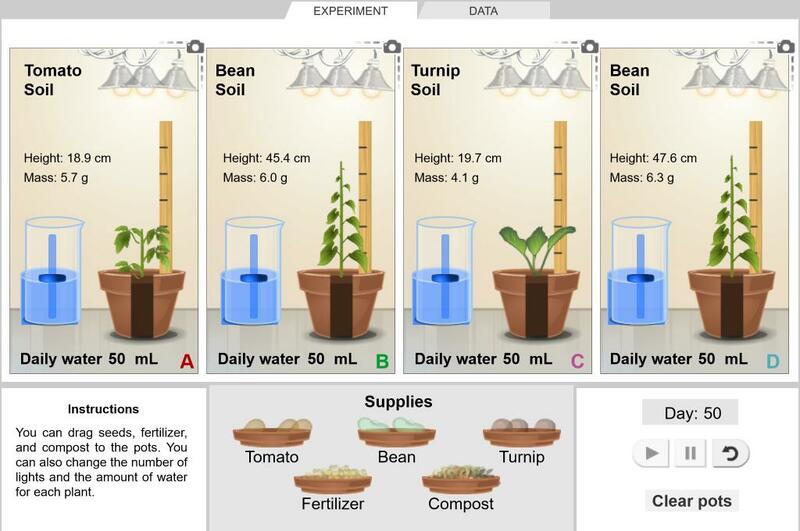 uses Growing Plants Gizmo to introduce students to Experimental Design, using screenshots and some dialog... (more)ue. could be used to demonstrate procedure for Science Fair, or to do a shortened Sci Fair (this takes 20 min from beginning to end), or to teach design concepts. Through this task, students will gain experience using the Smarter Science inquiry framework and followin... (more)g an investigative process that includes observation, brainstorm, asking questions, designing experiments, analyzing observations, and discussing conclusions. This Gizmo has been adapted for a Year 4 webconferencing lesson using digital whiteboards. The exploratio... (more)n guide has been slightly modified and four assessment questions have been added at the end. Scientific Method in Growing Plants! This gizmo is an excellent opportunity for students to apply the Scientific Method in a virtual experimen... (more)t.
Two activities then a design your own experiement. Heavy on Independent Variable, Dependent Variable, Con... (more)stants vocabulary use. An "if then" hypothesis also used. I used this Gizmo to get my students thinking about how to best approach their plant investigation. The G... (more)izmo was useful to discuss setting up a controlled experiment and appropriate data to collect. This gizmo has been adapted for seventh grade. The exploration guide has been modified for the scientifi... (more)c method and includes: independent and dependent variables, control, and constants. The gizmo also gives students the opportunity to plan and investigate different hypotheses. No key included. This student data sheet works well for science notebooking, for compiling data from plant experiments, an... (more)d for electronic lab reports. I'll also upload an Answer Key. Good gizmo for grade 9 applied class for Scientific method lesson. Great activities! High student engagement! nice plant lab when you dont have time or materials to grow plants. i use this gizmo to teach inference and drawing conclusions. Students go from computer to computer analyzing each others' plants. This is a GREAT Gizmo to help students learn about the Scientific method. Use the Word documents and edit to meet the needs for your class. Challenge: Can you grow a plant to exactly 20 cm? What conditions made it possible? This lesson is great fro teaching the scientific method. Can also be used to introduce Science Fair to students. Great for applying the Scientific Method! This is a great Gizmo to use to teach graphing using Excel Spreadsheets. Use the 'Export' feature and 'Chart Wizard' feature. This is a great gizmo to help with learning the scientific method! Students learning about the scientific method quickly realize that they have to keep all but one variable constant. This GIZMO goes great with our plant unit - great way to change variables and observe results. Excellent for teaching variables to kids grades 3 and higher. I love this Gizmo and so do my kids!!! Excellent Scientific Method! Uses lots of math skills too. Great Lab to teach the scientific method. I have used it primarily as a reteaching tool. Excellent way to conduct a plant experiment when you don't have time to actually grow plants. A great way to introduce Gizmos and for the students to understand that they only change one variable in an experiment. Growing Plants is great for Kindergarten through 5th grade. It can be simple or complex. Great way to cover scientific method! I used to draw this on my board. With some exploration guide modifications, this was a great way to reinforce independent and dependent variables.